﻿ How to download video from Facebook to PC or MAC? How to download video from Facebook to PC or MAC? Facebook, a famous social network, allows people to share news, photos, videos and communicate with their friends easily. Each day, you may get a lot of interesting posts and want to download photos and videos for offline access. However, unlike photos, people can't find a download button for posted videos. How to download video from Facebook to PC or MAC? In this article, we will show you a powerful tool to help you download video from Facebook within three steps. 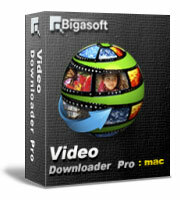 Firstly, download and install this Bigasoft Video Downloader Pro Facebook video download tool PC version or Mac Version. This tool is compatible with latest OS, such as Windows 8(PC version) or Mac OS X Mavericks(Mac version). Copy the post's URL to the main download panel. Then select Download Quality, Destination folder and format for output. Most popular formats are supported, such as AVI, MOV, WMV, MP4 or compatible format for portable devices. Click Download button to get Facebook video downloaded easily. The video will be listed on Activity panel. You can pause and re-start the downloading anytime you like. After a few minutes, the Facebook video will be downloaded and converted completely. When you find funny videos or new movie previews, download and enjoy them on any media device with Bigasoft Video Downloader Pro. Tip: This Facebook video Downloader also can help you rip other online videos to local disk, including YouTube, Google Videos, Metacafe, eHow, Vimeo etc.